Have a look at the sights and sounds of more than 700 recently admitted students at Brown University. 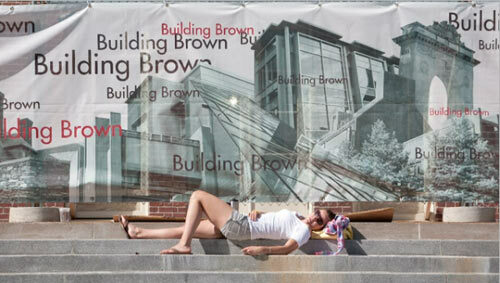 The audio slideshow includes a photo (at 00:46 sec) of a student relaxing in front of the Building Brown construction fence scrim. The collage of campus architecture is a well-recognized part of the Building Brown brand developed by Malcolm Grear Designers for the University's Campaign for Academic Enrichment. The Building Brown scrim and wayfinding sign system provides a pedestrian-friendly and uniform look to the numerous construction and renovation projects at Brown.